If there is one thing we all wish we had more of, it would be time. With everything we have going on, 24 hours just doesn’t seem like enough. If you figure 9 hours of work, 6-8 hours of sleep, travel time to and from work, time spent on housework, time spent with the kids, time spent at the grocery store or on other errands, it all seems to add up to more hours than there are in a day. Since there will always be 24 hours in a day, the only thing we have any control over is how we can best utilize those hours. The question is how. How can we structure and prioritize the hundreds of “tasks” we face everyday? A couple years ago I picked up a book (for free at the library, of course) by Stephen Covey titled “The 7 Habits of Highly Effective People.” It was a very interesting books with a lot of ideas about how to, you guessed it, become more effective, both in the workplace and at home. Anyway, one of the things mentioned is the idea of thinking of anything that takes up your time as being in a 2 x 2 matrix, with four quadrants. I know what you’re thinking: “Matrix? Quadrants? This sounds overly complicated. I just want something simple.” Well bear with me here, because it really is simple. This category is for those tasks that have to be done and have to be done soon. These are the emergencies and upcoming deadlines. Your air conditioning goes out in the middle of a 90 degree week or you have a project at work due in a couple days. You really have no choice but to spend the time necessary to get these things done. This category us for those tasks that need to be done, not not necessarily right away. Changing the oil in your car or replacing your furnace filter are good examples. Updating the wording in an office memo template or rearranging your workspace to make things more efficient are also good examples. This category is for tasks that are mostly interruptions. We’re in the middle of working on something, and we get a telephone call. The call itself may not be that important, but the ringing phone makes it urgent. You’re spending some quality time with you wife or kids, and you receive a text message. The message may not be important, but the beeping notification makes it urgent to check. This category is for tasks that don’t really serve a purpose. You spend an hour after work watching television or playing a video game to “unwind”. 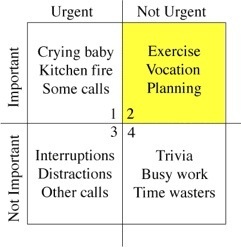 The trick to better time management is to gradually spend more and more time on the two “Important” quadrants. It’s easily spend time on the important and urgent tasks. If those don’t get done there are serious consequences. But it’s easy to neglect the important and not urgent tasks. There is nothing there to drive your attention to those tasks, since they can be out off until another time. But what happens when we neglect to spend time on them is they move from important and not urgent to important and urgent. If you don’t maintain your vehicle, then it eventually breaks down and takes more time and money to fix than it would have taken to simply maintain. If you procrastinate on a long-term project, it eventually comes an emergency that you’re forced to spend much more time on all at once. While it’s easy to neglect the important and not urgent asks, it’s also just as easy to put too much time into the not important and urgent tasks. Not every phone call, text message, or email is important and worth spending a lot of time on. Be aware of this and let the caller know that you’ll have to get back with them later. Don’t keep your email open all the time, but set a specific schedule for checking emails. And try to limit the time spent on not important and not urgent tasks. I understand the need for relaxation and entertainment, but be mindful of how much “downtime” you’re really taking. By consciously asking yourself which quadrant the task you’re currently spending time on is in, you can make sure you focus on the important things. I read a very interesting post over the weekend at Get Rich Slowly. It was a guy writing about how he switched from a job he was passionate about for a “boring” job. It turns out the job he was passionate about was so stressful that he was suffering from a severe case of burnout. He enjoyed the work but not everything else that came with it. So he switched to a 9-5 job that has a lot less stress and pays just as much (if not more). He doesn’t “love” this new job, but overall he is happier with the way things are now. It got me thinking a little bit about career choices in general. I hear and read advice to high school and college students all the time telling them to pursue their passion… that the only way to be happy with life is to be doing something you love for a living. I can certainly see both sides to this. On the one hand, I can see that life could get pretty mundane if you go in every day to a job that you absolutely hate. On the other hand, if you’re in a low-paying job that you really love the, then the stress of struggling to make ends meet can be just as bad. My senior year in high school, I decided I was going to college to become a high school social studies teacher. I always enjoyed the subject and thought teaching was a very respectable profession. I still think that, though our educational system definitely needs some work. Anyway, when the time came to register for classes at college I decided that teaching wasn’t a very profitable career (financially), and I decided to go for computer science (since I was also somewhat of a computer geek). I enjoyed working with computers, and the career research said you could make a decent living in a computer-related job. After one year of computer programming class in college, I knew it wasn’t for me. It wasn’t that I couldn’t handle the work… it was just so boring (to me). So, I picked something else. I thought over what I wanted to do when I graduated. There were several majors that I knew I would enjoy, such as history and sociology. But when I thought about job prospects, I had no idea what I would do with a degree in those fields. One of my friends was majoring in accounting and said the job prospects were really good in that field. I enjoyed business and was pretty good at math, so I thought I’d give it a shot. Three years later I graduated with B.A. in accounting near the top of my class. I didn’t have any trouble at all finding a job with decent pay and reasonable hours. I’m happy with it. Do I “love” my job? I don’t know that I’d go that far. My point is that what you do for a living does not define who you are as a person. When you meet someone for the first time, one of the first questions that come up is “What do you do?” How should I answer that question? Typically, I would say that I’m an accountant. But I could just as easily say that I’m a father helping to raise an amazing baby boy, a man trying to be a better husband, or that I’m a blogger trying to help people achieve their financial goals. I know that what people mean by the question is “What do you do for a living,” but why does that even matter? You can be happy with your life without working a job that you are “passionate” about. – You can be passionate about kids without working in childcare, social work, or education. Instead, you can work at a factory and do volunteer work at a community center or school. – You can be passionate about animals without working at a veterinary clinic. Instead, you can have your day job and volunteer at a local shelter. – You can be passionate about music without signing with a record label. Instead, you can work your day job and sing/play side gigs. Now, if you’re able to get a job in a field you’re passionate about, that’s great. But what I’m saying is that’s not the only way to be satisfied with your work. You can have a “boring” job and still follow your passions. Going from earning $25,000 a year to $50,000 should lead to a huge increase in happiness. The $25k increase in wages helps that person go from the working poor to right around the median income. It enables them to buy adequate food, housing, healthcare, and have money leftover for savings and retirement (at least here in the midwest with our low cost of living). The person may be working more hours or a more sophisticated job, but the extra work makes a big difference in their status of living. Going from earning $150,000 to $175,000 (a similar $25k increase) does far less to increase that person’s happiness. They already had all their needs met with plenty left for entertainment, charity, etc. The extra $25k is certainly nice; maybe they’ll vacation in Europe rather than Mexico. But it’s not enough to dramatically make life better. This person is typically working 60 to 80+ hours a week, and the hours and stress of the job can start to get to them. I don’t know where the best point on the income curve is, though studies have shown that around $75,000 is about right to achieve optimal happiness. The point is that, while it is certainly worthwhile to work hard, develop skills, and “over-achieve” to increase our income, we need to be mindful that there comes a point where making more won’t lead to meaningful benefits. I know I’m not at that level yet (and you may not be either), but it’s something to think about the closer I get to that point. Many people think of their job simply as a means to an end. In other words, it’s just something they have to do in order to pay the bills, put food on the table, and provide for their family. But let’s look at a job from another angle. I propose that your job can and should be viewed as an investment. I can hear it now, “How in the world is my boring 8 to 5 job an investment?” Before getting into those details let’s look at what exactly an investment is. The basic definition of “investment” is placing money or capital in something that gives returns or appreciates in value. For example, when you invest in a stock you’re putting money into a share of a company in hopes of receiving dividends or that the share price will increase. You invest money in a savings account to earn interest. Your job should be viewed in a similar light. My job is an income stream. I know that if I put in a certain level of work, I will receive a certain return. Now, where it gets interesting is that to a certain extent I can influence that return by changing how much I invest in my job. I can do the bare minimum required for the position and my income stream will most likely stay at the same level it is now. But if I increase my investment by taking on additional duties, taking the time to streamline a process, spending less time at the water cooler, etc. I stand a better chance at a higher income stream when my annual review rolls around. I can increase my investment by seeking additional training and education to expand my set of skills, which can also lead to a higher income. We’ve all seen people at work or in school who are like this. They go that extra mile and put in that extra effort to make sure they’re putting out a quality product, be it a report, a piece of assembled equipment, or providing great customer service. Sometimes their co-workers poke fun and call them “over-achievers.” Those that say that also tend to be the same people complaining when the “over-achiever” is awarded the promotion or gets the bigger raise. So keep in mind that your job is an investment. You can increase your return by putting a little more into it.